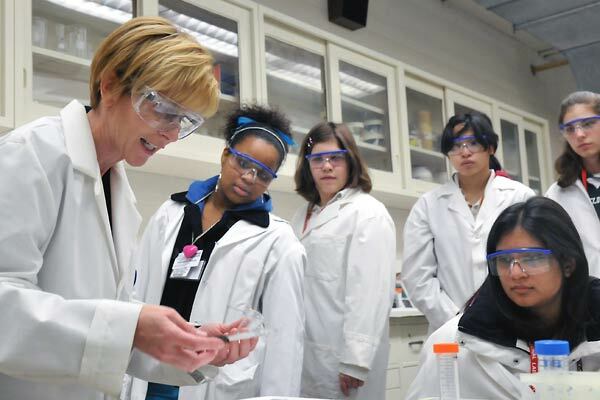 Women have a long history of being underrepresented in the scientific fields. Though society has taken leaps and bounds from its primeval segregation of gender, women still make up less than a quarter of all employees in the STEM fields. Some people attribute this discrepancy to ever-present gender stereotypes, while others blame a lack of female role models. However, if young girls are willing to look back in history, they will find hundreds of inspirational female scientists, from aerospace engineers to anthropologists. Here are just a few groundbreaking female scientists to inspire the inventors of tomorrow. Every April 22 the United States celebrates Earth Day, a holiday which would be nonexistent without the hard work of Rachel Carson. As a child, Carson was infatuated with both writing and biology. After earning a master’s in Zoology at John Hopkins University, she used both of these interests to procure a job as a radio scriptwriter for the US Bureau of Fisheries. In her free time, Carson supplemented her meager pay by writing articles about her marine research. She wrote two books—Under the Sea-Wind and The Sea Around Us—before publishing her most famous work, Silent Spring. This novel spoke out against the widely used pesticide DDT. Carson chastised companies for using the chemicals without researching its harmful effects on the environment. Though the chemical industry painted Carson as a bumbling liar, her accounts of dead fish and poisoned livestock prompted the government to take action. Carson’s Silent Spring led to the creation of the National Environmental Policy Act and the Environmental Protection Agency. Both of these organizations still promote environmentally friendly habits and work to protect the biosphere that Carson so dearly loved. Every time someone says they have a bug in their computer, they are unintentionally giving a nod to Admiral Grace Murray Hopper. She is credited for coining the term “computer bug” after tracing an error in the Mark II computer to a moth lodged in the relay. However, Hopper’s influence extends far beyond this common colloquialism. Having a love of math and technology since childhood, she was the first woman to graduate Yale University with both a master’s and a PhD in Mathematics. After the bombing of Pearl Harbor in 1941, she joined the US Naval Reserve, where she was stationed as the lead programmer on the massive Mark I computer. While serving, she helped develop the first computer designed for consumer use. She also invented A-0, or automatic programming language zero. This program condensed binary into a more manageable file, so programmers no longer needed to spend hours typing out strings of 1s and 0s. Nowadays A-0 is credited as being the first compiler (a system that converts instructions into machine code). Without Hopper’s contributions, computer technology today would be drastically different. Born in 1842, Jacobi grew up in a world heavily against women pursuing careers in any scientific field. In 1873, a professor at Harvard University published a book with one central message: the strain of college education causes women to become infertile. Though society highly praised his writings, Jacobi saw through his thinly supported claims and set off to debunk his baseless assertions. Against the wishes of her parents, Jacobi earned a degree at the Woman’s Medical College of Pennsylvania before moving to Paris and becoming the first female student at France’s Ecole de Médecine. Here she set to work disproving the Harvard professor’s claims. She surveyed a multitude of women, chronicling their menstrual cycles, monthly pain, and pulse. She even had subjects undergo muscle strength tests before, during, and after menstruation to prove that monthly bleeding had no effect on muscular functions. Her report effectively unfounded all previous assertions against women receiving higher education. Jacobi’s work was instrumental in allowing future female scientists, like Virginia Apgar and Jane Wright, to get the education they needed to change the world of medicine. Valentina Tereshkova grew up during the peak of the Cold War and Space Race between Russia and the US. Born into a poor Russian family, Tereshkova studied in school as a child before working in a textile mill. As a young adult, she took up skydiving and joined a local aviation club. Her unique hobby caught the attention of the Soviet space program, which was looking to send a female into space before the US. The Vostok space flight required its cosmonaut to eject at 20,000 feet during reentry. Tereshkova’s skydiving experience made her the perfect candidate for the revolutionary flight. Though she was one of four women selected to begin training, Tereshkova was the only candidate to complete a space mission₆. During her flight, she orbited the earth 48 times in 70.8 hours, more than all previous American astronauts combined. Though another woman would not break through Earth’s thermosphere for another 17 years, Tereshkova’s flight marked a turning point in the gender segregation of universal aviation. These four women came from four very diverse fields of science. Whether it be Carson’s marine biology or Hopper’s programming, their discoveries and innovations were crucial to shaping modern knowledge of the material world. But they are definitely not the last women to contribute their discoveries to the realm of science. Who knows? Anyone could be next! Related: Search for colleges and universities with Science majors on CollegeXpress! Regan Collins is currently a high school student with a love of all things art, writing, theater, and science. When she's not studying, you can find her performing in school plays, leading Student Council, and volunteering at the local zoo.